Our poodle pictures newsletter is emailed to you whenever we have updates or news to share with our readers. You will get poodle chihuahua mix information and pictures, information on how to rescue standards, how and where to buy toy puppies to add to your family, and see monthly funny poodle pictures. When Poodle Pictures.com discovers a new news story, article or picture - something we feel will interest our readers - we'll tell you about these in our ezine. If we discover a new toy we feel would benefit our readers – and be fun for our dogs to play with – we’ll let you know! 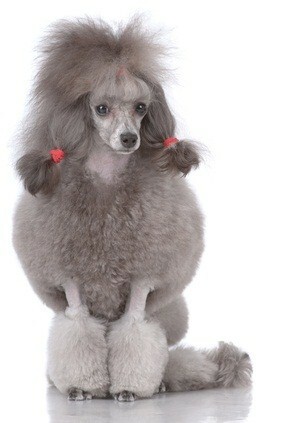 Poodles are very news worthy dogs! As proud owners, we know the above average intelligence that our dogs have. They also have very fun and unique personalities and love to make their owners laugh. We'll also tell you about new yorkie poodle hybrid mixes and where to find them, tell you the newest and cutest poodle clips information, and give you information on standard, miniature and toy care to keep your beloved pet healthy and well. Your dog is an important and loved member of your family, so look to our newsletter for dog health care questions and answers along with free puppy training tips to start your new addition off right as a member of the pack. If you are already a reader of our website, you know you will find lots of photographs, information on what food to feed your pet, where to find rescue shelters, how to effectively and lovingly train your poodle, and more. We encourage you to follow us on Twitter, Like us on Facebook and on Google. You'll be kept up to date on everything new on our site. Thanks for staying connected with us! Subscribe to our newsletter, leave us your comments, and we’ll keep you updated on all things poodle!